Earlier this month, I ran a series of on-site trainings for a longtime client that advocates energy policy in Washington, DC. Over the course of three days, I taught a range of professionals – policy wonks, emergency preparedness teams, spokespeople and engineer types who study our nation’s energy grid – on varied topics like persuasive writing, crisis and media strategy, effective presentations and verbal Q&A. Here was a wide assortment of more than 100 professionals learning a number of communications skills to reach audiences as diverse as federal regulators, industry CEOs, community groups, member companies and state/local government leaders. The week was a success; and when it was over I realized this breadth of issues, expertise and communications goals served as an ideal proving ground for the Communications Ecosystem. It’s also the perfect occasion to launch this inaugural blog post. 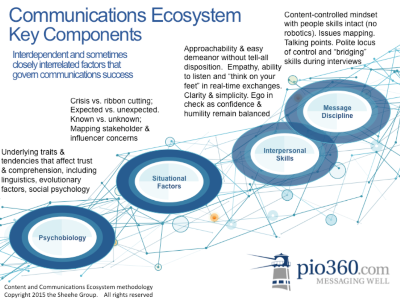 As its name suggests, PIO360’s Communications Ecosystem is a systems-based approach – backed by both research evidence and real-world experience – to quickly assess conditions and help formulate the best communications strategy and tactics for most any communications challenge. It’s designed as an assessment tool that communicators can use in real time to vet issues and concerns across a range of stakeholders and situations. Again and again with my trainees, I invoked the Ecosystem as their dashboard to understand audiences and frame whatever communications challenges or opportunities lay before them. I held it up as a practitioner’s lens for sharpening focus on the issues, players and dynamics that impact a communications goal – whether it’s media interviews and public meetings, or real-time interactions with internal audiences, lawmakers, regulators, peer groups or other key influencers. What a rewarding feeling, then, to see the “aha” moments and positive session evaluations accumulate throughout the week across such a wide range of specialists and issues. They “got” it; the Communications Ecosystem made sense to them and their worlds. It was relevant and intuitive. Developed from decades of practical experience and my work with numerous federal agencies and universities – most centrally the Centers for Disease Control and Prevention and George Mason University – the Communications Ecosystem charts interactions of key components like Message Discipline, Situational Factors, Interpersonal Skills and Psychobiology. My primary goal in developing the Ecosystem framework is to create for communications the same kind of evidence-based tools that have helped strengthen other disciplines like medicine, education and criminal justice. Keep in mind we’re talking about an ongoing aspiration more than an endpoint: The work to wed evidence to practice will always continue, and it’s built on some pioneering efforts by others – particularly the CDC’s Barbara Reynolds and GMU’s Gary Kreps – to combine academic research and industry experience in ways that create usable, practical guidance for communications professionals everywhere. Research is great; so is real-world experience and lessons learned. But you get the most value when you’re able to combine these into something that’s powerful, flexible, repeatable and relevant to the practioner’s world.